In modern society, many of the great leaps forward in healthcare and overall quality of life can be attributed to the biopharmaceutical industry. Many formerly debilitating or fatal diseases have been brought under control thanks to vaccines and therapies developed in biopharmaceutical labs. Because these products are developed from organic materials, absolute precision in measuring is an absolute must to ensure a safe, effective, and consistent product. Until recently, digital scales made to measure weights in biopharmaceutical labs and production facilities were only available from specialty scale manufacturers at great expense. However, Arlyn Scales, a 30-plus-year leader in producing top-quality digital scales, has harnessed Surface Acoustic Wave (SAW) technology to create its line of Ultra Precision scales to meet the ultra-exacting standards of the biopharmaceutical industry and others, at a manageable price. The Surface Acoustic Wave (SAW) technology built into each of Arlyn’s Ultra Precision scales is the “secret sauce” that delivers unmatched precision to biopharm labs and manufacturing plants. The most commonly used scales employ strain gage load cells that are based on a spring element, typically aluminum or steel, that include thin sections which are very fragile and susceptible to temperature changes, which can lead to undesirable variations in results. Another type of high-accuracy scales, the force restoration scale, has platforms directed by a flexure system that takes very precise measurements, but this flexure is very fragile and expensive. Arlyn’s Ultra Precision scales use SAW technology to measure displacement instead of the strain on the spring or flexure element. A surface acoustic wave is a bulk wave traveling along a piezoelectric surface, such as lithium niobate. This displacement results in the scale load cell operating at 10 percent of the strain levels found in strain gage scales, with none of the errors that affect the traditional spring element load cell. SAW scales provide accuracies of about 1/100 of 1 percent, 10 times more accurate than strain gage scales, and as accurate as force restoration scales, but at a less expensive price point. Since no biopharmaceutical lab or production plant can afford to be bogged down by scales requiring frequent maintenance, another advantage of Ultra Precision Scales to be aware of is their comparative durability. SAW load cells are measurably 5 times as rugged as typical strain gage cells, due in large part to the thickness of the load cells compared to strain gage scales. 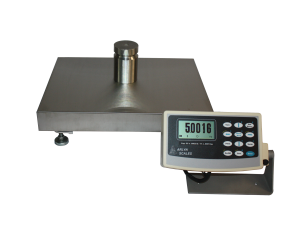 This thickness enables the Ultra Precision scale’s load cell to withstand common occurrences such as shock loading (dropping items on the scale from height) or overloading (placing items exceeding the scale’s rated capacity on the platform). Strain gage load cells are considerably thinner and less resilient to this type of treatment over time, requiring more maintenance and providing deteriorating levels of precision. Users of strain gage scales grew accustomed to having to make a choice about which was more important to them in a scale: high resolution or high capacity. The conventional wisdom was that the higher the capacity of a strain gage scale, the lower its resolution. For industries dealing with large quantities of bulk materials, such as food manufacturing or fertilizer, accuracies to 1/100 of 1 percent are inconsequential, while the ability to measure heavy weights is critical. But other industries live or die by their ability to measure out the minutest weights—with biopharmaceuticals prominent among these. With Arlyn Ultra Precision scales, this trade-off is no longer an issue. Thanks to SAW technology, these scales’ resolution at greater capacities exceeds that of strain gage scales. For example, Arlyn Scales’ 620X strain gage model has a 10-pound capacity and a resolution of two thousandths of a pound (0.002). Arlyn’s Ultra Precision SAW-X model also has a 10-pound capacity, but it has 20 times the resolution of the 620X at one ten-thousandth of a pound (0.0001). Another Ultra Precision model, the SAW-C, has 10 times the capacity of the 620X strain gage, but twice the resolution. Ultra Precision Scales are more accurate than strain gage scales even when capacities increase exponentially. As mentioned above, force restoration scales are also incredibly expensive compared to Ultra Precision scales. Our SAW scales are comparably priced to a high quality strain gage scale, which is significantly less than a force motor restoration scale. Ethernet & WiFi – Control your scale from anywhere with an Internet connection thanks to our Ethernet & WiFi connectivity. USB – Simply connect a USB cable to your Ultra Precision Scale and be able to control as well as access weight data from your computer. Datalogging – If you’re not able to connect a computer to your scale you can simply connect a USB flash drive directly to your scale and download weight data for later analysis. As the biopharmaceutical industry strives to innovate to make tomorrow’s solutions to today’s problems, Arlyn Scales strives to innovate with these high tech companies to help them meet these challenges. Located in Long Island, New York, in the top metropolitan statistical area in the United States for the biopharmaceutical industry, Arlyn Scales works tirelessly to understand this sector and deliver top-quality weight measurement instruments to help them achieve continued success. Whether in the biopharmaceutical field or one of the many other industries we serve, Arlyn Scales designs and builds scales to every capacity, level of precision, and budget. To learn more about us (and so we can learn more about you), please contact someone from our dedicated team today at 800-645-4301 or through our contact form. We look forward to hearing from you and learning about how we can help you.